In this multi-disciplinary and multi-sited volume, the authors challenge reductionist and oversimplifying approaches to understanding China's engagement with Southeast Asia. Productively viewing these interactions through a "resource lens", the editor has transcended disciplinary and area studies divides in order to assemble a dynamic and diverse group of scholars with extensive experience across Southeast Asia and in China, all while bringing together perspectives from resource economics, policy analysis, international relations, human geography, political ecology, history, sociology and anthropology. 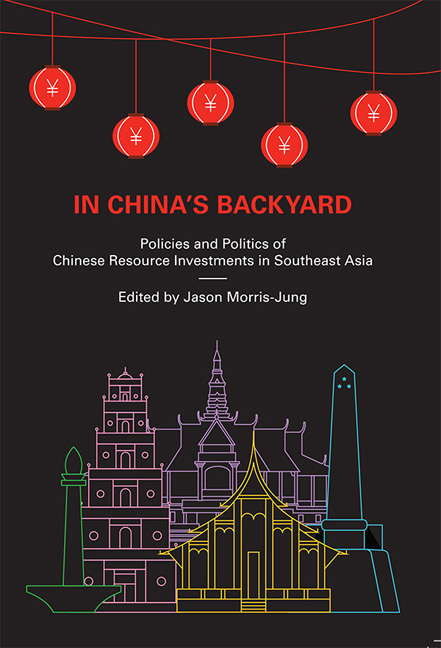 The result is an important collection that not only offers empirically detailed studies of Chinese energy and resource investments in Southeast Asia, but which attends to the complex and often ambivalent ways in which such investments have become both a source of anxiety and aspiration for different stakeholders in the region. By Diane Tang-Lee, completed her PhD at the University of Manchester in 2016. Many Chinese large-scale investments, particularly those in the energy andnatural resource sectors, have encountered nationwide protest in Myanmar.These protests have radically called for project terminations, which partlyresulted in President Thein Sein's decision to suspend construction on theChinese-backed mutli-billion dollar investment in the Myitsone dam in2011. This incident has been widely regarded as a turning point in what hadhitherto been seen as close relations between China and Myanmar. Bringingthe research gaze down to the local level, this chapter examines the contextand conditions of interactions between key Chinese actors and Myanmarcivil society. It argues that a restrictive legal and political context,organizational limitations, and dismissive attitudes towards civil societyhave engendered mutual suspicion and mistrust between local Myanmaractivists and Chinese companies. This, in turn, has hindered the developmentof more formal or regular communication channels between actors anddisadvantaged Chinese efforts to build reputation and trust within the widerMyanmar public. In recent years, under the democratizing environment in Myanmar, civil society has mounted forceful campaigns against irresponsible foreign investment practices, which have included Chinese, Thai, Indian and South Korean companies. However, Chinese investments account for about a third of Myanmar's total cumulative foreign investment of US$62.6 billion, as of 2017. Most of the protest has been in the energy and natural resource industries, whose propensities for extensive socioenvironmental impacts have encountered the most resistance. Much of it has been labelled and, indeed, presented itself as “anti-Chinese”. As this chapter demonstrates, however, the causes of protest in Myanmar are multiple and complex. Protests have played a critical role in compelling Chinese interlocutors — including state-companies, the embassy in Yangon, the Chinese Ministry of Commerce, and Chinese scholars — to confront the demands of Myanmar civil society. This chapter will first provide a brief overview of Chinese investments in Myanmar, followed by an examination of anti-Chinese sentiments as they have emerged through complex historical relations, local politics and Chinese investment practices. It analyses how Chinese interlocutors, whose conventional diplomatic and business approach is to deal predominantly with host governments, perceive and interact with local civil society actors in Myanmar, especially as their protests make these interactions inevitable. By Philip Andrews-Speed, Senior Principal Fellow at the Energy Studies Institute of the National University of Singapore., Mingda Qiu, Research Associate with the Freeman Chair in China Studies at the Center for Strategic and International Studies (CSIS) in Washington DC., Christopher Len, Senior Research Fellow at the Energy Studies Institute, National University of Singapore. Chinese energy and mineral companies have been investing overseas formore than twenty years, and the quantity and size of their projects havebeen growing steadily. Although Southeast Asia is not a preferred regionfor these investments, they remain significant on account of their relativevalue to the host country and because of the geostrategic importance ofthe region for China. Most of the companies making the investmentsor undertaking the projects are wholly or partly owned by the Chinesegovernment at either central or local levels. As a result, the motivations fortheir investment activities reflect a mix of corporate and state objectives.Corporate objectives include securing energy or resource supply chains,increasing or diversifying their asset base, and enhancing their profits ormarket share. Government motivations range from direct support tocompanies for purposes of industrial strategy and resource security toindirect support through development assistance, diplomacy and regionalstrategic positioning. China's economic engagement in Southeast Asia has grown markedly in recent years, and this includes the energy and mining industries. In addition to importing energy and mineral commodities from the region, Chinese enterprises have been investing in primary resources and constructing energy infrastructure. While the objectives of these companies are often primarily commercial, they are also multi-faceted and involve the ambitions of both the enterprises and the Chinese government. In addition, this mix of objectives varies between the different resource industries. The aims of this chapter are to identify the specific motivations of Chinese enterprises and government in their engagements with Southeast Asia's energy and mineral resources, and examine some of the implications from their mix of corporate and state drivers. Over the last three decades, one of the most significant changes in the context of development in the Global South is the transformation of China from a capital deficient developing country to a rising capital exporter in the world economy. For a long time, the main form of China's capital export is its massive purchase of US Treasury bonds. But since the Hu Jintao era (2002–12), the Chinese state has diverted ever larger part of its foreign reserves to outgoing direct investment in infrastructures, mines, and other assets in the developing world. China's official financial institutions also started offering concession loans to other developing countries. Africa has been the most prominent recipient of Chinese investment, partly because of the PRC's longstanding presence in the continent since the height of Cold War and partly because of Africa's abundance in fossil fuel and mineral resources that China needs desperately for its roaring developmental machine. “China in Africa” has been an established field in development studies. Numerous papers and books debated whether China's increasing presence in Africa would elevate the region's growth prospect or whether it represents little more than a new form of extractive colonialism. China's ambitions in becoming a major capital exporter to the developing world is surely not restricted to Africa. Chinese investments in Latin America, the Middle East, and Southeast Asia has been increasing rapidly. Among all these regions, Southeast Asia, which is right at the doorstep of China, is the most interesting one, and it is poised to becoming the most important arena for China's overseas projection of political-economic influences. China's presence in Southeast Asia dates back to premodern times, when many states in the region paid tribute to the dynastic state ofimperial China and conducted trade with China via Chinese diasporic traders in the region. Time and again, some states in the region attempted to challenge Chinese dominance and sever its tributary ties to China. But at least in the perception of many officials and intellectuals in China, these challenges did not alter the reality that China had been hegemonic over Southeast Asia all along until Western imperialism shattered this Sinocentric other in the mid-nineteenth century. China's link to the region receded in the mid-twentieth century because of Cold War division, only to be restored after China's reintegration into the capitalist world in the 1980s. By Jason Morris-Jung, Senior Lecturer in Social Research at the Singapore University of Social Sciences (SUSS)., Pham Van Min, currently teaching at the University of South Australia. Since the turn of the millennium, Chinese economic activity in Vietnamhas been growing in scale, diversity and geographical coverage. Anincreasingly important area of this growing activity has been in naturalresource and energy sector projects. More recently, they have also been asource of public discussion and controversy, generating some of the mostspectacular incidents of domestic protest in the post-war era. However,as this chapter argues, to view these incidents simply as historicalanimosity towards China misses a lot. Rather, they reflect complexconjunctures of multi-level governance problems and contextual factors,among them Vietnam's on-going geopolitical tensions with China in theSouth China Sea. This chapter examines recent trends and public concernsemerging around China's growing economic activity in Vietnam, andthen explores in more detail two case studies of popular resistance to largeresource sector projects with Chinese involvement, namely a controversyover bauxite mining in the late 2000s and attacks on Chinese workers at amassive steel factory in Central Vietnam in 2014. Since market reforms in the 1980s, foreign investment has been and continues to be a driving force for Vietnam's economic development. Since normalization of bilateral relations in 1991, Chinese economic investments in Vietnam have increased dramatically. More recently, they have also shown a growing interest in Vietnam's rich mineral and energy resources. Geographical proximity makes Vietnam particularly interesting to Chinese resource companies, especially for minerals that have high transportation costs. Furthermore, shared histories, cultures and socio-political organizations have facilitated trade and business relations between these two nations. On the surface of it, Chinese demand for natural resources and Vietnam's need for foreign investment is a perfect match. Yet one does not have to dig very deep below the surface to find a much more problematic situation. Recently, the General Director of the Department of Geology and Minerals of Vietnam publicly complained that up to 60 per cent of mineral licenses in northern Vietnam showed “Chinese traces”. It was as if, he suggested, “the Chinese were standing behind our back and controlling our own mining industry”. While the widespread opposition towards Chinese involvement in bauxite mining in the late 2000s was perhaps a first signal of unrest, the riots that targeted mainland Chinese workers at a Taiwanese-owned steel factory in Central Vietnam in 2014 demonstrated just how grave the matter can become. By Cecilia Han Springer, doctoral student in the Energy and Resources Group at the University of California, Berkeley. Coal is the dominant source of energy in Asia, and China and Indonesia are itsleading producers and consumers. Understanding the interconnection betweentheir coal industries also illuminates their shifting geopolitical relationship, whichhas become stronger through resource-based economic ties despite the occasionalcontest over issues on sovereignty. China and Indonesia have maintained a hugeand mutually beneficial coal trade for many years, and this coal-based relationshiphas been nationally and globally influential. However, the China–Indonesia coaltrade dropped precipitously in 2015 when shifting political and economic contextsdrove both countries to decrease their levels of exchange. China's domestic airpollution and climate mitigation policies led to a large decrease in demand forcoal, while Indonesia introduced new policies, including new restrictions oncoal exports, to promote economic development and nationalization of its energyindustry. However, the changing incentive structure resulted in new directionsfor the China–Indonesia coal relationship, further strengthening the economicties that undergird their geopolitical relationship. The China–Indonesia coalrelationship is no longer a consumer–producer relationship defined by trade andexport, but is instead shifting toward Chinese investment in coal productionwithin Indonesia. China is becoming more involved in coal-related infrastructurein Indonesia, especially electric power generation. These new directions willbe critical for understanding the environmental and economic impacts of coal. Southeast Asia is one of the only regions in the world in which coal will constitute a greater share of the energy mix in the future. China is the world's top producer and consumer of coal, while Indonesia holds these same titles within Southeast Asia, producing 89 per cent of the coal in Southeast Asia. Indonesia is also the world's largest coal exporter. The coal industry has major political sway in both countries. China and Indonesia have become politically and economically entangled through coal trade and investment. For the past several years, their intimate import–export relationship has dominated global steam coal trade in both volume and market power. Although other regional partners, namely Australia, are major suppliers of coal to China, this chapter focuses on Indonesia due to the growing importance of the China–Southeast Asia relationship for global resource governance. Southeast Asia has a huge natural resource endowment, including biodiversity and carbon stocks in its forests, major fossil fuel reserves, minerals, and ores. By Tai Wei Lim, Senior Lecturer at SIM University and a Research Fellow adjunct at National University of Singapore East Asian Institute. Morris-Jung's introduction to this volume began with a macro analytical framework of China's resource encounters in Southeast Asia. It pulled together a wide diversity of issues covered in the individual chapters to introduce the central framework of this volume, which is a careful and detailed analysis of diverse issues centred on local and national development, environment, justice, power relations, territoriality, sovereignty and many others. Morris-Jung's chapter painted the complexities that all authors in the volume grappled with. How do scholarly works capture the highly-nuanced, contextual and complicated domestic and external factors behind the “new wave” of Chinese investments into the Southeast Asian region, which represents an interplay of both opportunities, challenges and risks? Morris-Jung correctly identified the multi-layered implications of these investments and subsequently each chapter contributor highlighted and surveyed these complex layers through case studies, local-area examples, contextual analysis and empirical data. What Morris-Jung and the other chapter contributors have highlighted is the complicated ecology of state-owned enterprises (SOEs), private sector firms, local communities, regional elites, nationalpoliticians, Chinese diaspora and bureaucracies interacting with each other. In analysing them, we should not, as Morris-Jung reminds us, fall into a territorial trap of resource extraction based on unquestioned assumptions of (1) territory as geometrically bounded and inwardly focused and (2) the sovereign autonomy of the nation-state. This would unnecessarily delimit the imaginative as well as analytical spaces available, which the rest of the chapter contributors have explored with vigour and incision. Therein lies the most important contribution of this edited volume — a multi-perspective and multi-spatial analysis of the ecology of Chinese mining, resource extraction and investments in the diverse region of Southeast Asia. Philip Andrews-Speed, Mingda Qiu and Christopher Len's chapter “Mixed Motivations, Mixed Blessings: Strategies and Motivations for Chinese Energy and Mineral Investments in Southeast Asia” identified the specific motivations of Chinese enterprises and government in their engagements with Southeast Asia's energy and mineral resources, and examine some of their implications from their mix of corporate and state drivers. In this chapter, the authors argue that the increasing participation and investment of Chinese hydrocarbons, petrochemicals and commodities/resource firms may be showing differential outcomes in Southeast Asian countries due to varying incentives used, state priorities, global business experience, and sometimes less than optimal management. Although these firms attract Chinese funding to the region, it may also bring about negative impacts if project promises are not delivered. By Juliet Lu, doctoral candidate at UC Berkeley's Department of Environmental Science, Policy and Management with a focus on political ecology. As China's role in the global economy has grown, it has become increasinglyinvolved in developing economies through aid and overseas developmentassistance. China promotes a range of projects under the umbrella of“development cooperation” and has, on occasion, proclaimed an alternativedevelopment model to that of its Western counterparts. Such statements drawattention to how development operates as both a rhetoric and a practice forchannelling foreign investment abroad. This chapter examines how narrativesof a “Chinese model” has shaped the rationalization and practices ofChinese rubber companies in Laos through the Opium Replacement Program(ORP). The ORP is a Chinese state project active since 2004, which aims toeradicate opium cultivation by providing alternative agricultural livelihoods.This project catalyzed an influx of Chinese capital into northern Laos that hasdrastically transformed local agricultural systems, livelihoods and land uses.The ORP is an important case for analysing the challenges and contradictionsthat arise when Chinese concepts and China's unique historical experience ofdevelopment are transplanted into other contexts. In the late 1990s, the global price for natural rubber soared and Xishuangbanna — a major rubber producing area in remote southwest China — grew rich. Across the border in northern Laos, farmers and state officials looked on in envy at this miracle cash crop. Some began experimenting with it. When the Chinese government established the Opium Replacement Program (ORP) in 2004, it was welcomed in Laos as further support for the growing rubber sector. As a result, Lao rubber cultivation expanded significantly. The ORP was established to incentivize large-scale agribusiness projects to provide alternative livelihoods schemes as substitutes for opium cultivation in Laos and Myanmar. Chinese companies rushed to take advantage of the ORP and its financial supports. Though a range of cash crops were allowed, the vast majority of ORP funding went to establishing rubber plantations. Amid the initial rush, Chinese investors, Lao farmers and Lao state officials recounted stories of rubber's success in Xishuangbanna as justification. Rubber was a silver bullet that contributed to development, poverty alleviation, and modernization. But in 2011, as global rubber prices plummeted, dreams of new motorbikes, paved roads, corporate profits and hefty government revenues were suddenly dashed. The drop in rubber prices also dashed claims that China's development success was wholly replicable in other contexts. 5 - Indonesia–China Energy and Mineral Ties: The Rise and Fall of Resource Nationalism? By Zhao Hong, Professor and Director of the Institute for Comparative Politics and Public Policy at the Shanghai Institutes for International Studies., Maxensius Tri Sambodo, Researcher at the Indonesian Institute of Sciences (LIPI) –Economic Research Center. Energy relations between China and Southeast Asian countries have extendedfrom energy trade cooperation to equity investment and infrastructureconstruction cooperation in recent years. However, several factors arepushing some Southeast Asian countries toward resource nationalism andprotectionism. Local politicians and general public reportedly are concernedof China's ambitious plans for energy resources exploitation in SoutheastAsia. This chapter examines different concerns of and responses to China'senergy resource related investments in Indonesia, and demonstrates thatthe actual impact of Chinese energy investment depends not only on China,but also on the recipient country's domestic politics, regulatory system andstate capacity. Indonesia is rich in energy and mineral resources and it has allowed foreign companies to explore and exploit its oil and gas reserves sincethe early 1960s. Chinese national oil companies (NOCs) have long demonstrated interest in Indonesia's energy resources and they have developed many oil and gas exploration projects there. After the global financial crisis in 2008, China accelerated its foreign direct investment (FDI) to Indonesia and, for the first time, China was among the top five countries for levels of FDI to Indonesia in the last quarter of 2014. This may elevate energy cooperation to a new level. However, although Chinese government has planned to stake a long-term strategic energy investment in Indonesia through a range of policy incentives and Chinese capital has poured into resource and energy-related infrastructure sectors, emerging factors have been pushing the two countries’ energy ties toward difficulties and competition. Concerns in Indonesia that an increasing trade deficit with China will affect national economic security have stirred debates over how to protect Indonesian resource and mineral industries while maintaining trade ties with Beijing. Fearful of falling into a relationship of “dependency development” with China or other foreign mineralinvesting country, Jakarta implemented a new law banning the export of unprocessed ore in January 2014. Although the law aims to increase added value for mineral resources prior to export, the new regulations will affect Sino–Indonesian energy resource cooperation. Within this context of fraught political and economic relations, this chapter addresses the following questions: In what direction is the China–Indonesia energy tie going — towards cooperation or conflict? And can it provide a basis for a broader bilateral relationship? Historically, Indonesia has been an attractive country for mineral investors because of its rich mineral wealth. By Jason Morris-Jung, Senior Lecturer in Social Research at the Singapore University of Social Sciences (SUSS). Across Southeast Asia, the “rise of China” has inspired both anticipation and anxiety. A common aspiration throughout the region is that a strong China means economic prosperity for all. The prevailing wisdom is that the sheer size of the world's second largest economy and its demands for trade will translate into jobs, business opportunities, and economic growth for neighbouring countries. These aspirations have been bolstered by China's leadership in establishing the US$100 billion Asian Infrastructure Investment Bank (AIIB), as well as its ambitions to retrofit ancient trade routes with twenty-first century infrastructure as part of its “One Belt, One Road” initiative. Now with hints of American influence in decline, many eyes are looking to China as the region's new benefactor. If anticipation has been fuelled by visions of economic splendour, the anxieties have been more polysemic. Influxes of Chinese investment have been accompanied with waves of Chinese companies, workers and migrants, whose intermixing with local populations has generated both enthusiasm and distrust. The Chinese knack for keeping costs low has come with familiar concerns about social and environmental management practices, exploitation of local labour, and networks of chronyistic corruption. China's territorial claims and expanding military installations in the South China Sea have only helped to heighten geopolitical tensions both within and among individual Southeast Asian nations. Hence, while Chinese economic influence has been welcome, a stronger political, military and socio-demographic presence has been met with more equivocation, if not outright consternation. Amid these tensions, Chinese resource sector investments have emerged as flashpoints of protest and controversy. From government orders to suspend the Chinese-backed Myitsone dam and Letpadaung copper mine in Myanmar to national protests over Chinese resource sector investments in Vietnam, the Philippines and elsewhere, resource projects have come to be a “focal point” for tensions and anxieties surrounding China's rise in Southeast Asia. Indeed, resource development is an interesting angle from which to examine China's future roles in Southeast Asia precisely because it reflects the contested nature of development. Resource development is contested development. From “conflict minerals” to “resource curses”, political economies of resource development have been known to incite inter- and intra-state conflict, hinder socio-economic development, and bind already poor countries and communities into dependent relations with other more powerful nations. By Alvin A. Camba, doctoral candidate in Sociology at Johns Hopkins University. The literature on Chinese overseas foreign direct investment (FDI) in theGlobal South has generally pursued a global approach or state-to-stateanalysis. However, these overlook changes at the local level as Chinese FDI hasrekindled the emergence of historical tensions among groups, local strugglesfor control, and anxieties toward globalization in the twenty-first century. Thus,this gap presents an opportunity to analyse China's engagements at multiplelevels with a variety of regional actors across different scales, places, andcontexts. This chapter shows how the patterns and practices of Chineseinvestments in Philippine mining differ from conventional multinationalmining investments. First is the method of production. Multinational miningcompanies focus on large-scale mining (LSM), but Chinese investments tendto gravitate towards artisanal small-scale mining (ASM) to evade scrutinyfrom national authorities and hostile reactions associated with currentterritorial disputes between the two countries. Second is the method ofaccumulation. While multinationals use capital-intensive, ASM capitalizeson labour-intensive extraction, community-centred and house-driven support.And last are the host country linkages. While multinational mining companiesneed the support of national government agencies to pursue resourceextraction, Chinese mining relies more on connections with overseas Chinesecommunities in the Philippines to access subnational political elites, such asregional politicians, governors, and local officials. This chapter shows how the patterns and practices of Chinese investments in Philippine mining differ from conventional multinational mining investments. While Ching Kwan Lee has previously argued that there are different practices between Chinese and multinational mining companies in Zambia, the author suggests that Chinese investment in the Philippine mining sector presents an analogous case. First is the method of production. Multinational mining companies focus on large-scale mining (LSM), but Chinese investments tend to gravitate towards artisanal small-scale mining (ASM) to evade scrutiny from national authorities and hostile reactions associated with current territorial disputes between the two countries. Second is the method of accumulation. While multinationals use capital-intensive infrastructure and formalized ways of pursuing extraction, ASM capitalizes on multiple methods and ways: labour-intensive extraction, communitycentred and house-driven support, and flexible infrastructure. And last are the host country linkages. While multinational mining companies need the support of national government agencies to pursue resource extraction, Chinese mining relies more on connections with overseas Chinese communities in the Philippines to access subnational political elites, such as regional politicians, governors, and local officials. By Siem Pichnorak, graduate student in International Areas Studies at Seoul National University, Republic of Korea. Foreign aid and economic investment have been effective tools used byChina to leverage influence in many developing countries, includingCambodia. China is now the largest aid donor and investor to Cambodia.Despite positive aspects of China's presence, which include an increaseof FDI inflow, infrastructure development, and economic growth, China'ssubstantial investment in natural resource sectors also comes withsignificant costs. As one of the largest holder of economic land concessions,mining licenses and hydro dam construction projects, Chinese companies,often partnering with local companies and elites, have been involved withillegal land grabbing, deforestation, and human rights abuses. These issueshave prompted countless outcries and protests from local peasants, civilsocieties and international community. In addition, opposition parties inCambodia have leveraged these issues to accuse the ruling Cambodia People'sParty (CPP) of promoting a pro-China policy. This chapter explores thecomplex issues that have emerged around Chinese investment in Cambodiannatural resources. First, the chapter analyses structural factors in the Sino–Cambodian relations that have generated a favourable investment climatefor Chinese resource companies. Second, it investigates various recurringproblems emerging around resource sector projects of Chinese companies inCambodia. Lastly, the chapter evaluates the benefits and costs brought alongby Chinese investment in natural resource extraction in Cambodia with aview to preventing the fallouts of such investment in the future. If China has been “going global” since the early 2000s, it has gone regional for far longer. China's Cold War-era influence in Southeast Asia prior to the 1980s is well documented, after which both foreign and domestic difficulties led to a period of relative withdrawal. Since the end of the Cold War in the early 1990s, however, China's foreign policy toward its southern neighbours has increasingly re-embraced its outwardly engaged version of “peaceful coexistence”, as first articulated in the 1950s. Seeking both regional political stability and, perhaps more pointedly, access to natural resources for its own ongoing economic development, China's leaders are widely understood to see Southeast Asia as a strategic sphere of influence. In such a context, they have looked to development cooperation as a core mode of regional engagement for much of the last two decades. As a key locale of this strategy, Cambodia receives close attention from Beijing, given its pivotal position in the region. Since 1996, the relationship between Phnom Penh and Beijing has deepened. By Yu Hongyuan, Professor and Director of the Institute for Comparative Politics and Public Policy at the Shanghai Institutes for International Studies. This chapter analyses key challenges that China currently faces in securingsupplies of strategic mineral resources from its neighbouring or “periphery”regions. It provides some perspectives on Chinese state interests in ensuringlong-term mineral supply from its neighbouring mineral-rich countries,as well as offer policy recommendations on how China can improve onresource diplomacy in its “peripheries”. The chapter does not aim to becomprehensive in its review of these minerals, but instead surveys someimportant minerals to reflect on how Chinese strategies for sourcing mineralsfrom peripheral regions are relevant to China's mineral investments inSoutheast Asia. “Strategic minerals” can be defined as natural resources that are important to a state's economic development, national security or people's livelihoods. The US Geological Survey (USGS) includes additional criteria for defining “strategic minerals” as commodities that are not easily replaceable yet they are extracted mainly from foreign sources. Among industrialized nations, competition over theexploitation, production and accumulation of strategic minerals have come under international media attention. As China's economy has been developing rapidly since economic reforms that started in 1979, its consumption and import of strategic mineral resources has also increased significantly. According to the Chinese Academy of Engineering's definition of forty-five strategic minerals, China is in short supply or cannot guarantee adequate supply of twenty-seven different kinds of strategic minerals. More than half of them are currently imported from Southeast Asia and Australia, mineral-rich regions proximate to China. Southeast Asia is also China's most important supplier for nickel, aluminum ore (i.e., bauxite) and coal. As China's demand for strategic minerals is likely to keep increasing, based on projected slowing but continuing growth, China will need to consider several important factors to ensure accurate and realistic assessments of availability and accessibility for long-term resource supplies, especially from its neighbouring regions such as Southeast Asia. This chapter analyses the key challenges China currently faces in securing supplies of strategic mineral resources from its neighbouring or “periphery” regions (translated as “zhoubianguojia” in Chinese hanyu pinyin romanization), which refer to those countries and regions surrounding the Chinese overland borders and coastal areas. The “periphery” is a necessarily loose categorization, but it has particular significance because of the particular geopolitical and close economic relations that China shares with these countries and regions historically. By Menandro S. Abanes, Associate Professor of Social Sciences at Ateneo de Naga University and a Lecturer at the Safety and Security Management Studies (SSMS), The Hague University of Applied Sciences. When the Philippine Supreme Court issued a Temporary Environmental Protection Order (TEPO) against ninety-four “small-scale mines” in the Province of Zambales in 2013, the media touted the decision as anti- China, rather than pro-environment or anti-mining. Many of the big small-scale mines enjoined by the TEPO to “perform or desist from performing an act in order to protect, preserve, or rehabilitate the environment” are reported to be dummies of Chinese firms. The case was filed by concerned members of local communities of the province who complained that the mining operations were allegedly outside the designated allowable mining area, were polluting the environment, were unregulated and untaxed. Local and national government officials were also respondents to the case. Mining in general in the Philippines has been controversial and divisive. On the one hand, mining operations have been described by civil society groups and the Catholic Church as destructive to traditional livelihoods. On the other hand, mining has also catalyzed vibrant economic activities through job creation, infrastructure works and business establishments in economically stagnating localities. Thus, government officials and businessmen tend to favour and endorse mining projects.